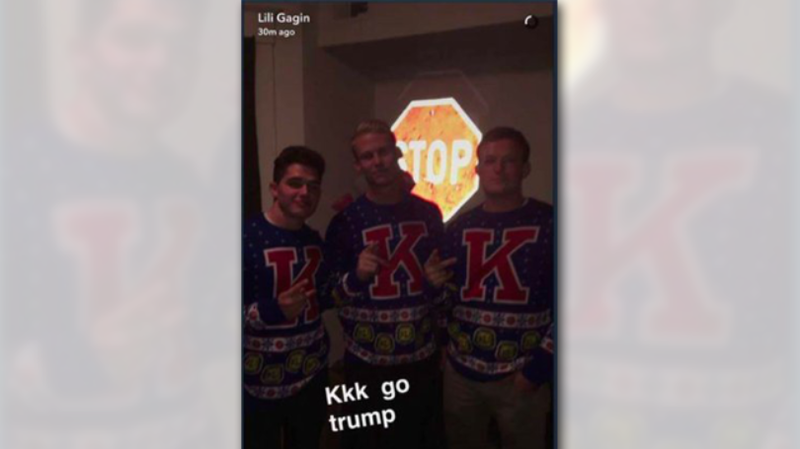 LAWRENCE, Kan. -- A University of Kansas cheerleader and three members of the school’s spirit squad are suspended from cheering after a photo linking the Ku Klux Klan with President-elect Donald Trump was posted on the cheerleader’s Snapchat account. The KU student whose account was linked to the post, Lili Gagin, and the three men in the post have all been suspended from performing, the Athletic Dept. said, CBS affiiliate WIBW reported. Associate athletic director Jim Marchiony said university officials learned of the posting during the men’s basketball team’s 83-63 victory over UAB. “She is suspended from cheering pending formal investigation,” the tweet said. Marchiony said the female cheerleader insisted Tuesday that someone took her phone at a party Saturday night and posted the Snapchat message.